A capping layer on top of masonry to protect it and to shed water. Can be many materials including brick, stone, slate, ceramic tiles etc. An individual stone coping. A masonry cover to the top of a wall or pillar etc. Various copings in the medieval masonry of Westminster Abbey. 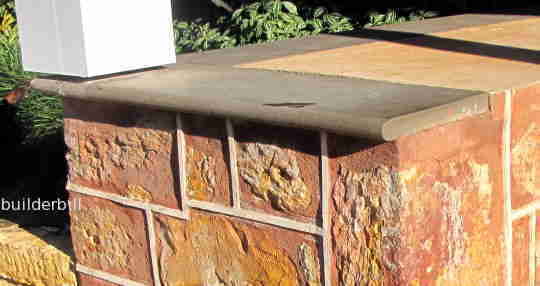 The name cope (which in itself can be used for a single coping stone) comes from the Latin for cap. So, like a cap we have on our heads; a coping stone is used for protection from the weather and also for decoration to give an embellishment to the top of some masonry. The photo above shows five different types of copings. 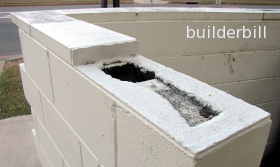 A point to note is that often they overhang the wall by a small amount to give a drip edge. To the right, talk about from the sublime to the ridiculous, is a coping course for a wall of concrete blocks, showing the reason why they need a cover. A purpose made ceramic coping. 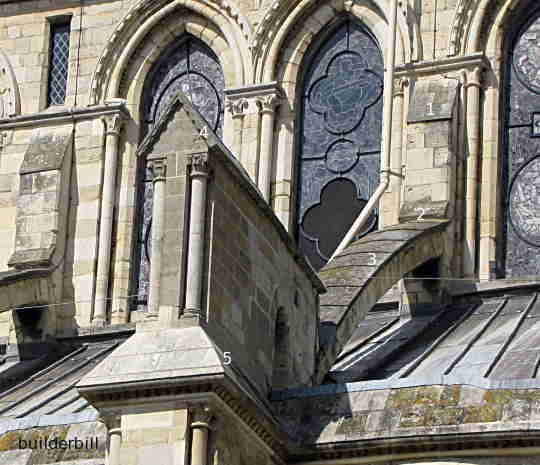 The coping above is a variant of ceramic tiles made for roof ridges and hips. 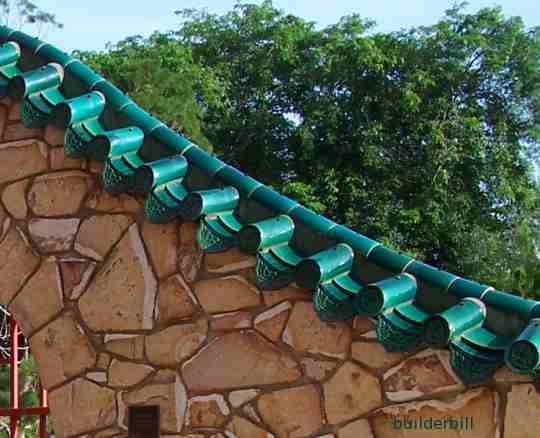 It is common to see mass produced ridge and hip cover tiles from clay and concrete roof tile systems used as copings. Why not, they are cheap but when they are used on garden and landscaping walls they blend in and lend a unifying theme to the architectural look. A slate coping to a wall on a heritage building. These slate bull nosed copings again are borrowed from another part of the building. They are used also as treads on external stairs.